This month’s Benefits Buzz reviews the ACA affordability percentage increase, provides the 2019 HSA limits and outlines the administration’s plan for lowering prescription drug costs. This month’s Benefits Buzz discusses the April 26 family health savings account limit change, highlights Department of Labor resources for mental health parity compliance and issues a reminder that the due date for the Patient-Centered Outcomes Research Institute Fees is just around the corner. This month’s Benefits Buzz explains the next steps for employers that missed the Affordable Care Act reporting deadline, provides a brief overview of the 2018 Employer's Tax Guide to Fringe Benefits and examines a reference-based pricing lawsuit. This month’s Benefits Buzz discusses how to handle an ACA penalty letter, emphasizes the importance of reviewing your SPDs and offers tips for avoiding complex tax scams. This month’s Benefits Buzz examines the latest spending resolution’s effect on ACA taxes, provides details about new disability claim rules and looks at the new HHS secretary’s position on the opioid crisis. This month's Benefits Buzz provides an overview of two major employee benefits changes, highlights the Department of Labor’s annual inflation adjustments for civil penalties for 2018 and briefly explains a new tax credit introduced by the Tax Cuts and Jobs Act. This month’s Benefits Buzz examines the new rules for disability benefit claims, offers important ACA reporting deadlines and looks at the latest tax bill’s potential impact. This month's Benefits Buzz provides an overview of the updated 2018 benefit plan limits, discusses the IRS’ reversal of the individual mandate compliance policy and briefly highlights the growth of telemedicine. 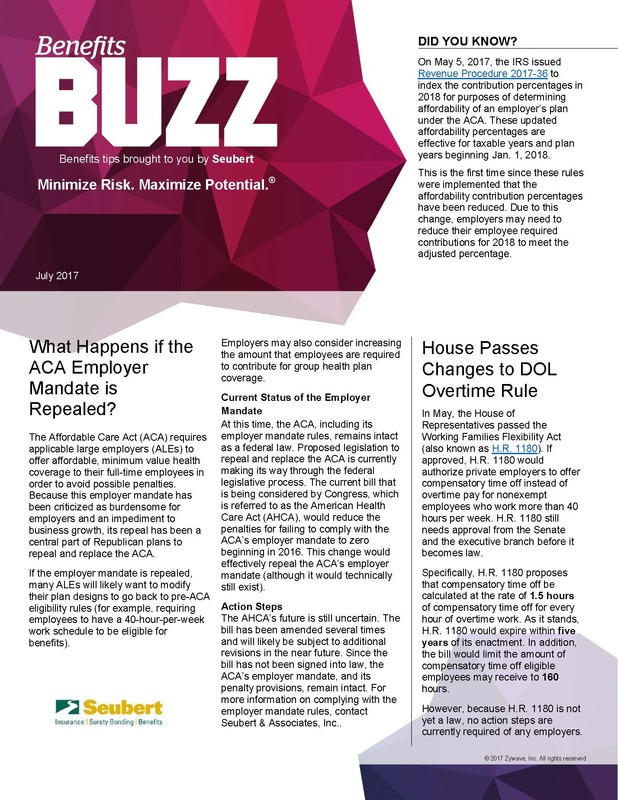 This month’s Benefits Buzz reviews the latest ACA repeal effort, explains why ERISA rules were delayed and provides an overview of insurance premium costs in 2017. 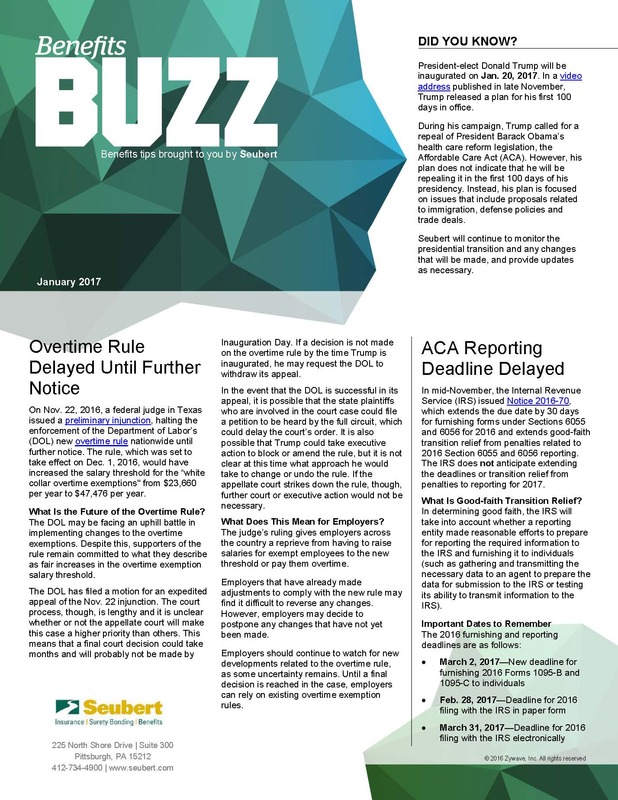 This month's Benefits Buzz discusses the court ruling ordering the Equal Employment Opportunity Commission to reconsider its final wellness rules, the new summary of benefits and coverage template required for the 2018 open enrollment period, and the latest developments of the Department of Labor's overtime rule saga. This month's Benefits Buzz highlights the rejected Affordable Care Act (ACA) repeal efforts, explains the new Form I-9 Sept. 18 requirement and provides information on the myRA program shutdown. This month's Benefits Buzz covers the HIPAA cyber attack response checklist, new fiduciary rules for providing investment advice, and updates to the DOL overtime rule. Benefits Buzz is a monthly newsletter that features two short, easy to read, hot employee benefits topics along with a "Did You Know" factoid. These condensed newsletters are perfect for giving an overview of the topics at hand, as well as additional links to find more useful information. In addition to benefits related information, we also have an HR Brief newsletter in a similar format.